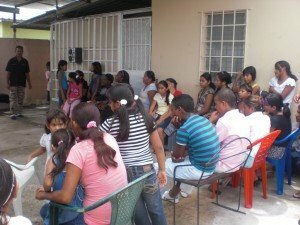 I’ve recently had the joy of connecting with a Spanish speaking small church. It’s a small church, bouncing from 15-40 in attendance. Our first visit was sometime 2006, maybe October. I’m clearly an American, so I stuck out. (When I visited a 700 member Spanish church in Panama, people welcomed me in English — my visit was a novelty). We were welcomed, greeted, introduced to the Pastor, invited for coffee. musicians starting music in different rhythms. If one was into nitpicking quality, this church could be a case study. their hospitality overcame all those potential drawbacks. The second time we visited, we were warmly received again, and invited to a home for Thanksgiving dinner. We go every Sunday night. We’ve been invited to homes, and in one case called 4 times by different people to make sure we were going to attend a cookout. We feel loved and accepted, even when I don’t understand everything spoken to me. In fact, there is one brother that I can’t understand at all. I need his heavily accented Spanish translated into Spanish so I can understand him. But they have the patience to repeat themselves and to make sure I understand. We will miss this little church when we leave. They have already scheduled a cookout / farewell reception (two of them, actually) for us. We have moved from visiting to belonging. The hospitality of this little church overcame lots of possible quality issues that could drive visitors away. A church that focuses only on quality but doesn’t welcome the visitor is focused on the wrong issue. When we were simply visitors, we weren’t ready to connect. Rather, this little church took the initiative to reach out to us, connect to us, and welcome us into their world. It was a one way street for a while. Their hospitality has helped us to emotionally connect to this congregation. Hospitality in a church sets a good environment for hearing the gospel proclaimed. Hospitality itself is not evangelism — rather it’s an environmental factor that allows the gospel to be heard without distraction. clean and bright nurseries for children. But let’s not be confused — hospitality is not evangelism. Evangelism seeks conversion and repentance and deals with salvation and faith. Hospitality seeks a repeat visit and to help the person connect to the fellowship. The focus of evangelism is a changed life, while the focus of hospitality is to create a first impression. Rather, church hospitality and welcome is a leg that supports the evangelism work of the church. Think of the time when you first connected to your current church. How important was the church’s hospitality to your decision to connect? Now how do you personally welcome the stranger in your midst? Do you want more first time church visitors to come back a second time and move from visiting to belonging?